Preheat oven to 400°F. In a pot with boiling water, cook jalapeños (blanch) for about 3-4 minutes. When they are done, immediately drop the jalapeños into a bowl of ice water to stop the cooking process. When they are cool, slice the jalapeños lengthwise, from stem to tip, leaving the stem intact. Using a small spoon, scrape the seeds and veins out from inside of the jalapeños and set them aside. In a medium bowl, combine cream cheese, liquid smoke, and chopped bacon bits, mixing them well. Fill each half of jalapeño with the cream cheese mixture. Lay a piece of pepper jack cheese over the jalapeño, just to cover the cream cheese mixture. Wrap each jalapeño with a slice of bacon, using a toothpick if necessary to secure the bacon. 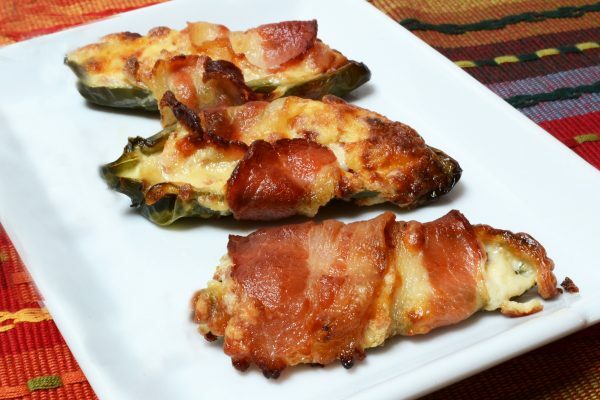 Place the stuffed jalapeños on a baking sheet (you can also use a flat rack placed inside a baking sheet to cut down on bacon grease). Bake for 30 minutes, or until the bacon is thoroughly cooked. When ready to serve, heat them up on a grill or in the oven and serve warm. Serve with jalapeño jelly.